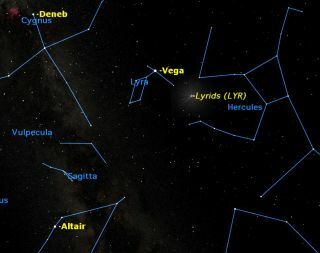 Lyrid meteor shower sky map, April 22, 2012. In April 2012, the brilliant planet Venus will shine at its brightest for the year and the Lyrid meteor shower will light up the night sky. But these are just a couple of the must-see skywatching events in the weeks ahead. Take a look at April's best skywatching events below and happy stargazing! The Full Moon of April is usually called the Egg Moon. In Algonquian it is called Pink Moon. Other names are Sprouting Grass Moon, Fish Moon, Seed Moon, and Waking Moon. In Hindi it is known as Hanuman Jayanti. The Full Moon rises around sunset and sets around sunrise, the only night in the month when the Moon is in the sky all night long. The rest of the month, the Moon spends at least some time in the daytime sky. The Last or Third Quarter Moon rises around 2:30 a.m. and sets around 12:30 p.m. It is most easily seen just after sunrise in the southern sky. The First Quarter Moon rises around noon and sets around 2 a.m.
Venus, the brightest planet, passes close to the Pleiades (Messier 45), the brightest deep sky object. Sky map of Venus on April 3, 2012. Saturn will be in Virgo directly opposite the Sun in the sky, and will move from the morning sky to the evening sky. It will be visible all night long. Saturn at opposition sky map, April 15, 2012. Mercury will be at its best in the morning sky for the year 2012 for observers in the southern hemisphere. Mercury at greatest elongation sky map, April 18, 2012. The Lyrid meteor shower occurs at the dark of the Moon. The best time to observe will be from midnight to dawn. Venus is always visible in daylight if you know exactly where to look. Today the waxing crescent Moon will be your guide: Venus will be visible just above the Moon. Venus is a week short of maximum brightness. Venus in daylight sky map, April 2012. Venus' crescent appearance, April 2012. Mercury will be a morning "star" during all of April, being at greatest elongation west on April 18. This is a favorable morning apparition for observers in the southern hemisphere. Venus is a brilliant object in the evening sky after sunset all month, reaching greatest brilliancy on April 30. The waxing crescent Moon will pass close to Venus on Tue. April 24, making it an easy target in the daytime sky. Mars is shrinking rapidly in size and brightness all month. In Leo all month, Mars is high in the southeast at sunset and sets around 5 a.m.
Jupiter is sinking into the west at dusk and will be gone by the end of the month. Saturn is in opposition on April 15 in Virgo. It is now visible all night long. Uranus is too close to the Sun to observe all month. Neptune appears late in the month, low in the eastern sky in Aquarius just before dawn.